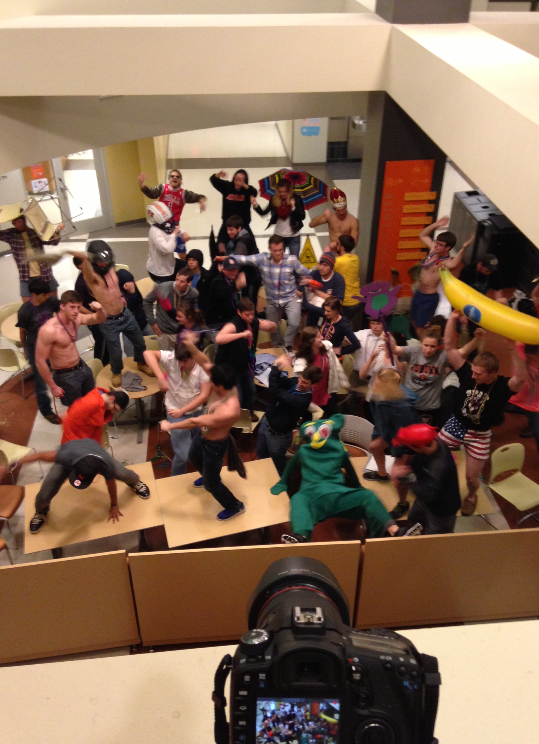 The new dance craze sweeping YouTube is the Harlem Shake, and Auburn has officially joined the movement. Alessio Summerfield, senior in radio, television and film, compiled, like, 160 Harlem Shake videos into one, and today around 5 p.m., we found students shooting their own Harlem Shake video in the Student Center. Most Harlem Shake videos begin with one person (usually wearing a helmet?) in a group of people dancing solo to Harlem Shake by Baauer. Then the bass drops. Then everyone goes crazy. How was the latest kids-these-days fad born? Who knows… but I think we’re into it for now. We’re told the video will be likely released sometime tonight or tomorrow morning. Related: Auburn a cappella group AU Capella makes awesome ‘Gangnam Style’ parody video featuring Aubie.